Jason Hartman interviews podcaster, Adam Graham, host of Old Time Dragnet Show, The Old Time Radio Superman Show, and The Great Detectives of Old Time Radio. 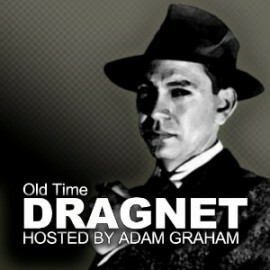 Adam resamples the old Dragnet TV shows, which are now public domain, in the old radio show style. This is a different approach from most of today’s podcasters, with only a small amount of commentary in the beginning and then addressing listener questions or comments that have been emailed or come from Twitter or Facebook, etc, after the show. Jason and Adam discuss copyright issues that can surround public domain usage. Adam said you must be very careful about the laws. They also talk about sponsorship, advertising, and donations, and how the economy affects the monetary gain. Adam also gives a scientific breakdown of his listening audience, which is primarily a younger male audience from a wide range of professions. Adam discusses the equipment and process to produce his podcasts, including using the ever popular Dropbox to transfer files to the audio technician. Adam advises that podcasters have a vision and stick with it, and stresses the importance of accompanying the podcast with blogging. Adam Graham is a novelist, columnist, and podcaster. His novel, Tales of the Dim Knight was published in 2010 by Splashdown Books. In 2011, he self-published All I Needed to Know I Learned from Columbo which focused on life lessons from fiction’s great detectives. Mr. Graham’s Political Columns have appeared on PJ Media.com and he was quoted extensively in a New York Times best selling non-fiction book. In March 2007, he began hosting the Old Time Dragnet Show with Adam Graham podcast and in 2008 began The Old TIme Radio Superman Show and in 2009 launched The Great Detectives of Old Time Radio. His blog posts on detective fiction, as well as golden age radio, television, and movies are available at Greatdetectives.net and are also available for subscription in the Amazon Kindle Store.